The two decade scholarly and archeological debate on whether King David was truly an imperial ruler was raised to another level when the two Israeli archeologists, Yossi Garkinkel and Saar Ganor of Hebrew University in Jerusalem revealed to the international public in mid-July, 2013 the archeological evidence that King David had built a royal walled compound at Khirbet Qeiyafa, to the west of Jerusalem. Over the centuries, the minimalists in archeology have had a field day debunking the biblical evidence that Kings David and Solomon and the United Kingdom in Jerusalem was a center of an imperial dynasty whose influence spread from the Mediterranean Sea to the west to the Euphrates to the northeast. They cited the lack of evidence of King David in the archeological record, that was until the year of 1993, when the first onslaught to dismantle the State of Israel began in Oslo to give away the central “mountains of Israel” to the unwanted Arab tribal peoples called the Palestinians, so also in that year the G-d of Israel chose to reveal in archeology for the first time, the name, the “House of David” in archeology. Was this a coincidence? We do not believe so! It was in this era that the United States, Europe with the Arab dictators in Saudi Arabia and Iraq sought to claim hegemony over the oil production in the Middle East. The State of Israel was totally dependent upon her Arab neighbors for the gas and oil that fueled the engines of Israel’s remarkable technological age. Now the spectrum of reality was now being revealed that in the future the Messiah son of David would become to claim its mantle of authority, this time not just over an imperial kingdom that spread from the Mediterranean Sea to the Euphrates but over Planet Earth and our entire solar system. Then suddenly at the northern tribal region centered at the ancient city of Tel Dan, where the Northern Kingdom of Israel placed the golden calf alters in their rebellion against the Davidic kingdoms central capital at Jerusalem, the Tel Dan Stele was uncovered. It revealed for the first time the name of “David” in the phrase (bytdwd), and the reading "House of David. Archeologists today have now “now widely accepted” this translation. Only then could we begin to see the evidence of rise of the small tribal kingdom of Israel that are now evident in the Bronze and Iron Age remains of the City of David uncovered in Jerusalem today in the urban core of ancient Jerusalem. These have been identified with the dynastic reigns of Kings David and Solomon and their later royal descendants in the Southern Kingdom of Judah, as investigated in the 1970s to the 1980s by Yigal Shiloh also of the Hebrew University. Even then it was not until the year of 2005 that the Israeli archeologist Eilat Mazar reported the discovery of the Large Stone Structure which she claimed was David's palace overlooking the Kidron Valley where the royal botanical garden and the Gihon Springs once watered the region for the royal family to enjoy. Then came the archeological discovery of the Mesha Stele from Moab that was dated to the same era of 850-835 BCE. In a place on line 12 where the interpretation in not certain because the lettering has been damaged, and on line 31, where one letter must be supplied, the “House of David” is again mentioned. Dating to the Iron Age Northern Kingdom of Israel under King Omri, the Mesha Stele account dovetails with the biblical account in 2 King 3:4-8 in the 9th century BCE where the Northern Kingdom of Israel headquartered in Samaria was referred to as the “House of Omri” and also refers to the Israelite god as Yahweh. In addition, if the French scholar André Lemaire's reconstruction of a portion of line 31 is correct — the earliest mention of the "House of David" (i.e., the kingdom of Judah) is mentioned. Also in line 12, Anson Rainey interpreted the two-word phrase ‘R’L DWDH to read as the “altar hearth of David” at Ataroth. This was one of the nearby towns that were captured by the Moabite ruler, Mesha. The sentence thus interpreted reads: “I (i.e. Mesha) carried from there (Atartoth) the ‘R'L of its DWD (or: it’s 'R'L of DVD) and I dragged it before Kemosh in Qeriot". As such, this would then become the earliest evidence of the existence of the Southern Judean Kingdom and its ruling Davidic dynasty of Kings David and Solomon. 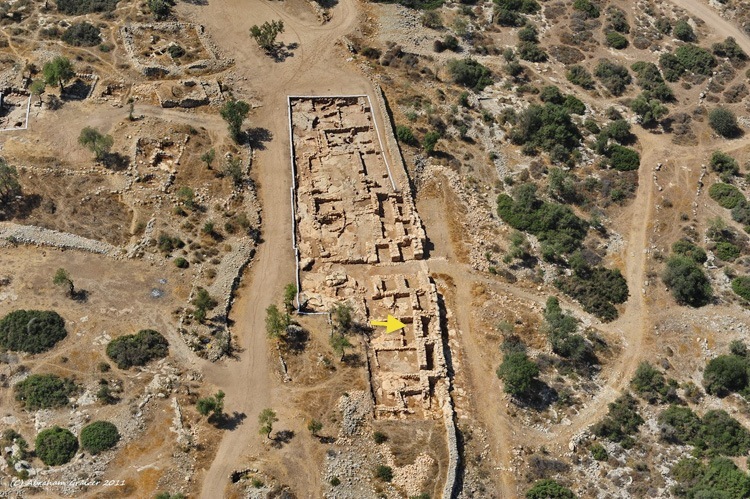 Now in mid-July, 2013, the discussion and debate about the literal rule of Kings David and Solomon has ratcheted up another notch as Yossi Garkinkel and Saar Ganor of the Hebrew University revealed the evidence of the 7-year excavations at the modern Jewish city of Khirbet Qeiyafa when it was unveiled to the international press. Here the Israeli Antiquities Authority has uncovered two large buildings “fit for a king” located at the ancient fortified Judean city of Shaarayim, meaning “two gates” which happens to be also the city where the young red-headed youth, called David, of the House of Jesse smote the giant called Goliath. Suddenly all the neo-reconstructions of the ancient biblical texts in the Jewish TaNaKh have made their Waterloo. It appears that the dispute on whether King David’s 10th century monarchy ruled from Jerusalem even existed, has now substantially been put to rest. Then there are the ancient reconstructions that King David was just a tribal chieftain whose rule was later embellished during the Jewish captivity in Babylon over more mythical ancestral legends. These are now beginning to crater. It appears that there are some who will always demean the glories of the Davidian kingdom in the ancient world. As the excavations came to a close on July 18, 2013, the mother lode is just beginning to be revealed and evaluated. Hundreds of archeological artifacts that had been discovered at the site were revealed to the international press. Bar Ilan University archeologist, Aren Maeir – “The archeological finds have not yet established who the residents were…It will become more clear if, for example, evidence of the local diet is found. Excavations have shown that Philistines ate dogs and pigs, while Israelites did not. The nature of the ceramic shards found at the site suggest residents might have been neither Israelites nor Philistines but members of a third, forgotten people. Evidence that the city was not Philistine comes from the private houses that abut the city wall, an arrangement that was not used in Philistine cities. There is also evidence of equipment for baking flat bread and hundreds of bones from goats, cattle, sheep, and fish. Significantly, no pig bones have been uncovered, suggesting that the city was not Philistine. Garfinkel, on the other hand weighs in on the Jewish and Davidian claims to this historic site, because of the fact that within the royal compound were numerous cultic vessels that were typical of the vessels used by the Judeans that were under the rule of King David and later King Solomon. Yet opposed to the north at the capital city, Samaria, in the Northern Kingdom of Israel where there were also no trace of bones from the remains of pigs discovered at this one site. With the palace fortress was also under the rule of the Judean priests and Levites, the inhabitants here were also under the halakhic rule of kashrut (clean meats). As the archeologists testified, since the consumption of pork was forbidden according to the halakhic standard of the dietary laws of Judaism and thereby was forbidden, this then became the “unequivocal evidence” with Garfinkel and Ganor that Khirbet Qeiyafa was not Philistine, Canaanite, but rather Israelite in its identity. Just over a year ago, the Israeli archeologists discovered three large rooms in which they believed were used for cultic shrines. This evidence of using separate rooms within one building that was dedicated to religious rituals was a Hebrew cultic ritual not Classical Canaanite or Philistine style of cultic worship in which they used separate temple and separate cultic shrines for numerous gods and not just the One-G-d of Israel. Within the palace compound, they discovered three small portable shrines. These shrines were boxes shaped with different decorations showing impressive architectonic and decorative styles. Yet even clearer, there were no images of humans on any one of the cultic items. Citing biblical parallels, Garfinkel noted the existence of such shrines as written about in II Samuel 6. Even so, one of the shrines discovered depicted two pillars and a lion, which some scholars attest to the story of Sampson and the Lion, and Sampson’s final act of honor to the G-d of Israel, when the walls of a Philistine banquet hall collapsed when Sampson took his strong arms, wrapped them around the poles and the upper floor came crashing down upon the Philistine revelers below. In closing on the cultic evidence at Khirbet Qeiyafa, it was Garfinkel who testified that the style and the decorations that were upon these cultic shrines were quite similar to the to biblical description of many of the features within Solomon's Temple. What is most interesting are the archeological discoveries give clarity to the various ages from the days of King Saul, David and Solomon and then beyond until Jerusalem was destroyed by the Babylonians in the year 586 BCE. and later by the Babylonians in 70 CE. With the evidence of the small cultic shrines that were discovered, in May of 2012, the same archeologists announced the discovery that there were also three larger rooms that were also designed to be used as cultic shrines for worshippers. According to Middle Eastern archeology, it is accepted that the Canaanites and the Philistines practiced their cults within separate temple that were then used as cultic shrines. Yet, they did not have separate rooms within any of their temples that were dedicated only to religious rituals. All three of these three cultic rooms neither had any imagery of the likeness of the human body, nor did they have any images of the human figurine. So today, it is universally accepted that nowhere else in the world is archeology more contentious than in the Middle East. The very expression of “biblical archeology” is anathema to most ancient archeologists in that to them modern Israel is using today archaeological discoveries “in the field” to back up their claims to these historical biblical regions that their Jewish ancestors were the early inhabitants in the region. We still confess that the consensus of numerous modern scholars in the region still believe that there is no definitive physical proof that the dynastic rule of King David has been found. Yet, this “scholarly evidence” is staring them in the face and only gives fodder to the Palestinians that claim that the Old City of David in Jerusalem is part of their ancient ancestral history from the Jebusite Canaanites that preceded the rule of King David. Yet, even so, what they fail to comprehend is that Melchizedek, who was called the king of Salem in the days of Abraham was actually Shem, the son of Noah who at that time was the oldest living person living on Planet Earth. Not only that, Shem was the ancestral forefather of both the Jews of the House of Judah and the Lost Ten Tribes of the House of Israel. Even the Palestinians today deny that the biblical Jewish Temple of Solomon and later the Zerubabbel Temple that was modernized into King Herod’s Temple even existed. This is after they also conduct their own Palestinian archeological digs by bulldozing the archeological remains on the Temple Mount and trashing these remains in huge dump heaps thereby destroying the archeological evidence from the context of the deposition layers that lie around and beneath the Al-Aqsa Mosque. Yosef Garfinkel, co-director of the Excavations at Khirbet Qeiyafa Archeological Project sharing the evidence of the Rare Cultic Miniature Shrines found upon the Site. Garfinkel also made note that the decoration with each cultic shrine room also lack any evidence of human figurines suggesting the “the population of Khirbet Qeiyafa observed at least two biblical bans, on pork and on graven images, and thus practiced a different cult than that of the Canaanites or the Philistines.” Taking this a step further, three small portable shrines were discovered. They were decorated with three separate styles of decorations depicting “impressive architectonic and decorative styles” and only confirming the evidence of such shrines in the days of King Saul and the Prophet Samuel (II Samuel 6) of which one shrine was decorated with two pillars and a lion; stylistic memories of numerous features of the decorations within Solomon’s temple. After six years since the excavation at Khirbet Qeiyafa began, nearly 600 square meters of dirt has been unearthed over nearly 6,500 sq ft. of an Iron Age IIA city. Using the type of pottery styles to date the era of the fortressed settlement, the archeological date of the royal palace compound outside of Jerusalem was also recently dated to the dates of 1050 and 915 BCE by using two burned olive pits that were sent for carbon-14 dating at Oxford University. The biblical word called Sha’arayim, which means “two gates” in Hebrew could be better understood when a “second gate” towards the east was discovered in the year of 2008. So today, the 23-dunam or 5.7-acre site is now just slightly smaller than the formidable Jericho 6.0 acre walled city that the Children of Israel marched around until with the blowing of the trumpets; “the walls came tumbling down.” Even so, the walls surrounding the city were designed as a casement wall with fortifications as seen in more modern reconstructions as a vaulted chamber in a fortress that was intended to be impenetrable and could be used to protect the defending Israelite soldiers or the military food or armament storerooms. What is difficult in the dating of this fortress is the fact that every archeologist has a pre-conceived opinion on whether such fortifications came from the Middle Bronze Age to the Late Iron Ages I and II. In as much as the more isolated Egypt in the days of Kings David and Solomon was a late comer in the transition from Bronze military defense armament to Iron weaponry, the Israelites in the era of the judges into the era of the King Saul and then David and Solomon had to build up and large military force in a more accelerated transition from Bronze to Iron because of their near neighbors, the Philistines were earliest peoples that used Iron making weaponry which gave them a decisive advantage on the battlefield. The overwhelming legends surrounding the United Kingdom of King David and later the Golden Temple of King Solomon speaks volumes to the importance of gold and silver in the Hebrew economy. They used extensive use of brass in their symbolic armaments and their inherent allegiance with Egypt in spite of their past relationship as “oppressed peoples” in the early Pharaonic Egypt of their past. Then we witness the evidence of the history of Kings David and Solomon ruling over a land mass from the brook of Egypt to the Euphrates and the ignoble end of King Saul by the Philistines. It also suggests that the United Kingdom under Kings David and Solomon was also in transition from the Middle to Late Bronze Age in their cultural imperial life, but Early Iron Age in their rapid transition to military predominance in the entire Middle Eastern region. These facts suggest that this fortified city was no doubt first constructed during the United Monarchy of Kings David and Solomon of before during the reign of King Saul. It would appear that Sha’arayim could have been used by the later descendant kings of the approved Dynasty of Kings of King David and Solomon in the Iron Age but the archeological testimony does not collaborate with that fact. It does agree that this fortress was used by the Hasmonean Kings of the Maccabees during the era Antiochus Epiphanes IV down towards the era of the Romans and King Herod the Great. Consider then the archeological evidence with the dating of Khirbet Qeiyafa by the archeologists that actually put this cultural deposition level at Iron Age I and II. Yet the archeological evidence according to Garfinkel does not agree that this Davidian palace outside Jerusalem remained a functional royal palace for over 1,000 years from the days of Kings David to the last Hasmonean ruler, Queen Alexandra II who was taken captive by King Herod, and placed in house-arrest for the rest of her life at King Herod’s palace in Jerusalem or Jericho. It does agree that there are deposition layers that attest to the refortification of Khirbet Qeiyafa. These archeological facts are supported by the archeologist’s description of the remains where “500 jar handles bearing a single finger print, or sometimes two or three, were found. Marking jar handles is characteristic of the Kingdom of Judah and it seems this practice has already begun in the early Iron Age IIA.” Within “Area “A” the archeological digs extended deeper 5x5 metres and consisted of two major layers: Hellenistic above and Iron Age II below. So again it appears that Late Bronze and Iron Age I are mission. Area "B" also contained four squares, about 2.5 meters deep from top-soil to bedrock. This area featured both Hellenistic and Iron Age layers. Yet, surveys on the surface revealed sherds that extended as far back as the Early and Mid-Bronze Ages, plus also the periods from the Persian, Roman, Byzantine, early Islamic, Mamluk and Ottoman eras. The Hellenistic upper portion of the wall was constructed with small rocks that were placed on top of the earlier Iron II Age lower portions of the wall in the days of the kings of the Southern Kingdom of Judea. These latter were constructed of bigger boulders built in a casemate design. As described by the archeologists, the city gate that was excavated was built with large boulders that weighed upwards from 3-5 tons apiece. Below this region, in the lower region of the wall construction was located larger megalithic type boulders trimmed to be from 1 to 3 meters long and the largest and heaviest of them weighing upwards form 3-5 tons. Above that region was a much thinner wall, about 1.5 meters in depth using fieldstone small in its construction that raise the height upwards to 6 to 9 feet in height rising above the inclined perch of the fortified hilltop. Taking a broader view of the surrounding geo-political landscape, Khirbet Qeiyafa, also known as the Elah Fortress apparently was the westernmost fortress between the royal capital in Jerusalem and the north-south ridge of hilltop villages that separated the region of Philistia and Gath to the west and Judea to the east. Within this region, were several cities of the west that were cited in Joshua 15:35 as cities that became a part of the tribal inheritance of the Tribe of Judah that included in total of 110 cities plus “their villages” that were unnumbered. Beyond the ridge were a series of valleys that connected the two separate hilltop ridges that ran parallel with each other. Amongst all this With Elah Fortress (Khirbet Qeiyafa) having a strategic location overlooking a multitude of valleys, this royal fortress yet kept a clear viewpoint vantage of the Judean Mountains to the east towards Jerusalem the central command center of the Judean military of King David. The city itself was surrounded by a massive defensive wall that included stones that weighed upwards to eight tons each (16,000 pounds) and whose height ranged from 6 ft. 7 in. to 13 ft 1 in. in height. The construction of the walls was Davidian in style for they were built by constructing casement walls built similar to the walls of Hazor and Gezer. They were constructed with a pair of walls enclosed with a chamber in between each parallel wall. Towards the center of the city loomed over the rest of the construction was a spacious enclosed building similar to those built at the royal cities of Samaria, Lachish, and Ramat Rachel. This style of construction was also very Judean in design for the town plan were similar to those other ancient Judean cities at Beit Shemesh, Tell en-Nasbeh, Tell Beit Mirsim and Beersheba. Each of them had a casemate wall and the interior homes were constructed so they would actually be next to the casement as one of the dwelling rooms. What was most interested, this style of construction was never duplicated within any of the Canaanite towns nor those cities of the Philistines and neither the cities of the Northern Kingdom of Israel in Samaria. Within the fortress of Khirbet Qeiyafa, one ostracon, a trapezoid shaped pottery sherd was discovered in 2008. The five lines of writing contained an amazing message. This is with an amazing insight that possibly merges with the rapid change in the Israelites social culture of the Judges into the royal monarchial culture of the Kings of Judah and later the Hasmonean priestly rulers of the Maccabees. Protect the po[or and] the slave / [supp]ort the stranger. Suddenly a new reality about the beginnings of the Judean monarchy was beginning to unfold. Here was a Hebrew document at the Biblical Shaarayim, where King Saul kept a large contingent of his Israelite soldiers. To the west in the Plain of Elah, the Philistine army was encamped, taunting the Israelites and parading their new battle warrior, the giant Goliath before the Israelites warriors. This was not unlike modern Russia and Iran parading their missiles in yearly celebrations to taunt those internationalists that may oppose their entry into the global arena of world dominion. Today, the excavators at Khirbet Qeiyafa have identified this site as the Biblical Shaarayim, where Dovid ben Yishai (David son of Jesse), the young red headed sheep herder going to take food and provisions to his brothers who were soldiers for the new anointed King Saul would soon match up against the Philistine human armored tank. But first young David meets the new Israelite king, Saul who in consternation was not able to make a military decision on how to topple this raving giant. David nearby ponders why there was so much commotion in the camp. The story is today one of the greatest children’s stories of all times where David makes the choice to confront the Philistines new military weapon of mass destruction. David discards all the trappings of military defense from the shields, spears, plus body armaments and helmets, and take his own shepherd garb plus a sling shot and introduces the first cannon ball, a stone, that topples the giant to the ground. With the quick and decisive swing of the giant’s sword, reduces this “invincible weapon” to a headless heap of humanity. Consumed by the stories and the trappings that surround this ostracon, we are suddenly enthralled with the only known biblical text found in archeology about the rise of the Israelite’s first king, King Saul. The context of this era is centered amongst the transformation of the Israelite social culture from the era of the biblical judges, like Sampson and Eli, to the rise of a centralized royal government under King Saul and later Kings David and Solomon. Here were the days, in which the sons of Eli did not follow in the pathway of their father to become future judges of Israel. The young lad, Samuel, living in the home of Eli the Judge soon became part of the great Israelite transition from judges to monarchs within the cultural milieu of the Children of Israel. Even so, the sons of Samuel also did not choose to follow the moral upright standards of their father, and now the elders in Israel were asking the Prophet Samuel to anoint for them a new king to lead them and give governance as the Philistines were seeking to surround them like Hamas, al Qaeda and Hizbullah are seeking to surround the State of Israel today. In spite of Samuel’s reluctance, the G-d of Israel leads Samuel, Israel’s moral leader of Israel to anoint Saul as the first monarch of the Kingdom of Israel. If we are to believe the Émile Puech’s interpretation of the Qeiyafa Ostracon text, then within the context of this ostracon we begin to see the parallels between King Saul. In the Bible, Samuel’s sons do not follow his moral ways, and the elders ask Samuel to appoint a king to lead Israel. Despite his initial resistance to the idea, Samuel is guided to Saul, whom he appoints as the first monarch of the Kingdom of Israel. The establishment of a royal household for the king, with government officials, chamberlains and servants to serve the king with the divine injunctions not to oppress but to serve the G-d of Abraham, Isaac and Jacob. Printed in the Biblical Archaeology Review in May/June 2012, Gerald Leval’s article, titled, “Ancient Inscription Refers to the Birth of Israelite Monarchy”, the Émile Puech’s interpretation of the Qeiyafa Ostracon is explored in greater depth. Here the regional site of Shaarayim after David slays the Philistine giant Goliath, we then note that the Israelites were now in pursuit of the Philistines. According to I Samuel 17:52, this pursuit took them “on the way to Shaarayim” (two-gates). As such King Saul truly appears to have been originally associated with this new royal center and may have taken its first possession after the David’s great victory for King Saul over the Philistines. Here began Israel’s first assent into prominence in terms of its relationship with their nemesis the Philistines to the west. We can perceive hints of how both Israelite mercenary leader, David and the newly inaugurated King Saul were both prominent in the rise of the royal and administrative center at Khirbet Qeiyafa with the installation of a centralized royal court and administration in Jerusalem and also a secondary court, palace and administrative center overlooking the region of the frontier provinces towards Philistia. Even if this administration’s rule were to begin with the accession of King Saul as the new king of Israel, the soon after entrance of David as a the “military hero” to the entire Jewish populous thrust this young lad not only as a courtier or advisor to King Saul, but even gave David’s special skills of sedating the paranoid king with intoxicating music new meaning. This suggests that even though this ostracon inscription message is focused on the transitional period between the era of the judges and the newly established monarchy, the message still rings true to both kings and stands alone as the only and oldest biblical account of the formation of the first monarchial Kingdom of Israel. So as in our modern world we perceive again the finger of the Divine dividing the nations that are surrounding Israel. As David son of Jesse would later go forth and slay his tens of thousands, so also the rise of the United Kingdom of Israel would be perceived as the most blessed of nations. Riches of gold, silver and jewels began to flow into the control of the elevating majesty of the Davidian Kingdom of Israel and an era of righteousness would bring this legendary land created by the hand of HaShem the G-d of Israel where the G-d of Creation first created Adam and Chavah (Eve) in the garden of Eden here upon Mount of Zion in Jerusalem. With these glorious events beginning to unfold in our future, we will now turn back to the even greater majesty of the Palace of King David that was erected on Mount Zion. We wonder what the G-d of Israel is planning in our near future, with all of these wondrous evidences in biblical archeology that have been revealed that Kings David and Solomon were truly the regal imperial giants of the ancient world. What the prophetic testimony does affirm, when the messianic era of the Maschiach ben Dovid (Messiah son of David) is restored, Jerusalem will not just be the capital of a Greater Israel, but will become the center of the Jewish messianic rule for our Sun’s entire planetary system.